The president of any local bank will proudly tell you that their people, customer service, and community ties are the reasons they have attained high levels of customer loyalty over the years. While this is true, community-based banks are getting fewer opportunities to showcase these strengths to customers. Mobile and online banking have reshaped the way customers interact with their banks and gone are the days when customers would stop by every week to withdraw cash (from a long-term teller) and maybe grab a doughnut and cup of coffee with the bank president or a loan officer. Consumer preferences have shifted, and at the same time, greater regulation has increased compliance costs. Most products and services have become commoditized and bigger banks are enjoying economies of scale that smaller banks can only dream of when it comes to implementing technological solutions. So how do community banks differentiate themselves to compete in this ever-strained environment? As competition grows from big banks, credit unions and online financial institutions, community banks need to focus on engaging their customers more than ever. But how do banks know if their customers are actually engaged? More importantly, how do they know if their employees are ready and able to engage these customers? Engaged customers represent a bank's best opportunity for organic growth. They are more loyal, more likely to recommend the bank to family and friends, and account for a bigger share of wallet. 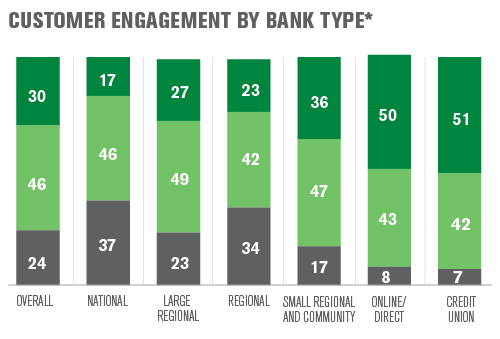 According to Gallup's most recent 2014 Retail Banking study, about 36% of U.S. customers at small regional and community banks are actively engaged with their bank. That's great news considering that only 17% of customers at national banks and 27% of customers at large regional banks are engaged. National and regional banks also account for the highest percentages of actively disengaged customers, 37% and 23%, respectively. These customers are not happy with the big players and would gladly move their money if given the right opportunity. Most would agree that a local bank with strong community ties and superior service would be poised to pick up all those disengaged customers, right? The problem for community banks is that 50% of customers at online/direct banks and 51% of credit union customers are currently fully engaged. This means that over half of the current customers at those institutions are actively recommending a credit union or online bank to family and friends who want to leave their own big bank, while just slightly more than one-third of community bank customers are doing the same. 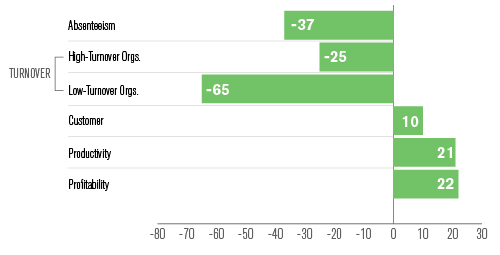 Mid-sized regional and community banks are getting squeezed from both sides of the market. Fortunately, community banks can still leverage that "local touch" -- but they have to start with engaging their employees first. Front-line tellers, call center reps, loan officers and branch managers will only deliver on superior service if they themselves are actively engaged in their jobs. Pay, job security and benefits may keep many bank employees rationally satisfied, but these factors do not engage them or and make them advocates for their company. Engagement starts by first measuring employees' psychological and emotional connection to their jobs and then working with local managers to boost engagement through targeted interventions. Local banks that can put the right people in place and engage them in their roles create internal advocates for the bank and its services. Engaged employees get to know customers better and provide more appropriate solutions. They go out of their way to delight customers and give them a reason to stop in for coffee and a doughnut while they discuss a line of credit. Engaged employees create engaged customers and organizations that can successfully develop this type of relationship realize a 10% lift in customer metrics, as well as improvements in other crucial business outcomes. Community banks face a shifting landscape. Larger banks are struggling to engage their customers and have the potential to lose over one-third of them if the right competitor steps up. This opens the door for community banks to capture a greater percentage of the market, but only if they take the time to create memorable customer interactions. To deliver on this service promise, they need to start by engaging their employees. Sales incentives are "easy"-- meet your goal, get your payout. But when you delve into how most banks incentivize on sales, red flags often appear in the nuances of these programs that cause misalignment between the desired behaviors and the desired outcomes.